Made in Ireland from genuine merino wool and cashmere, this fringe scarf features stylish graphic designs. A pleasure to wear, this herringbone pattern scarf is available in three different colours. Made in Ireland from genuine merino wool and cashmere, this fringe scarf features stylish graphic designs. Easy to pair with any winter outfit. 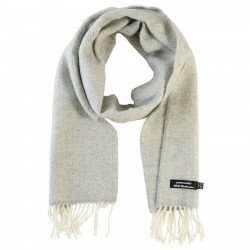 A very high quality, soft feel and warm scarf thanks to the cashmere and merino wool blend. One size: 23 x 200 cm. Four colours. 95% merino wool, 5% cashmere.